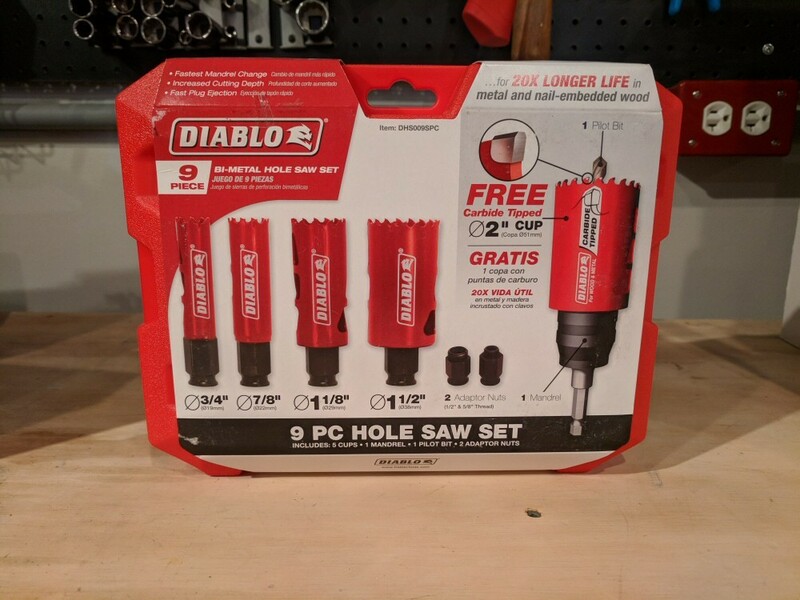 Hole-y Smokes – Diablo’s 9-Piece Hole Saw Set Is Nice! When we think of quality saw blades, we think of Diablo, so it’s very fitting that the brand makes a line of drill-attachable hole saws for use anywhere you need to put a hole larger than a drill bit. 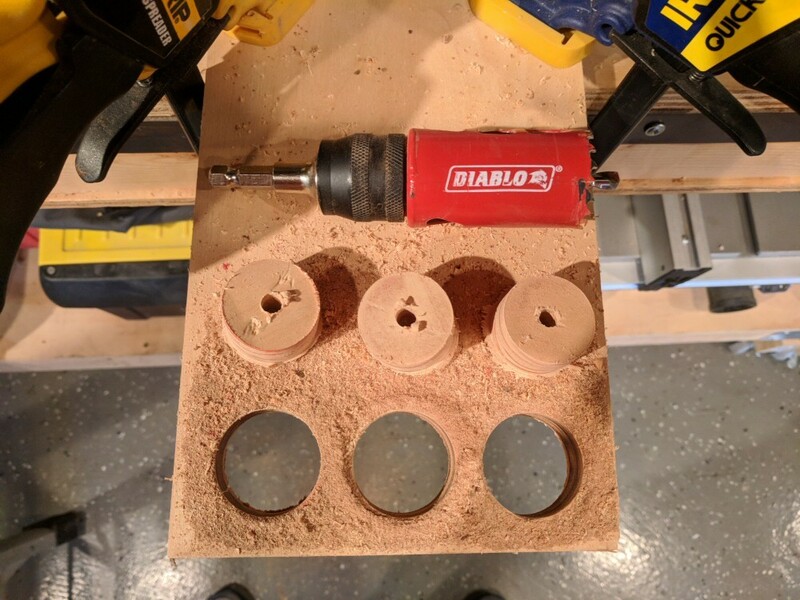 Today we’re taking a look at the Diablo 9 Piece Hole Saw Set. With Christmas right around the corner, this is one kit the DIYer in your life might not already have, and will surely come in handy. Stuff Lawyers Made Us Say: We’re partnering with The Home Depot to provide candid reviews of tools from a wide variety of manufacturers. The Home Depot is both providing the tools for free and compensating us; however, the opinions we express here are our own. Remember, we’ll always be up-front with you when we’re receiving a free product, compensation, or both. And of course we always strive for objectivity in our reviews. While not really material to the saws themselves, we’d be remiss if we didn’t mention how nice the packaging and carrying case for these saws really is. Right now the majority of our hole saws sit scattered in a drawer of our large toolbox. Diablo’s case for these saws is not only functional, it looks really nice. The designer of the case and packaging deserve kudos for their work. Five Hole Saws – 3/4″, 7/8″, 1-1/8″, 1-1/2″, and 2″. The 2″ saw is carbide tipped. 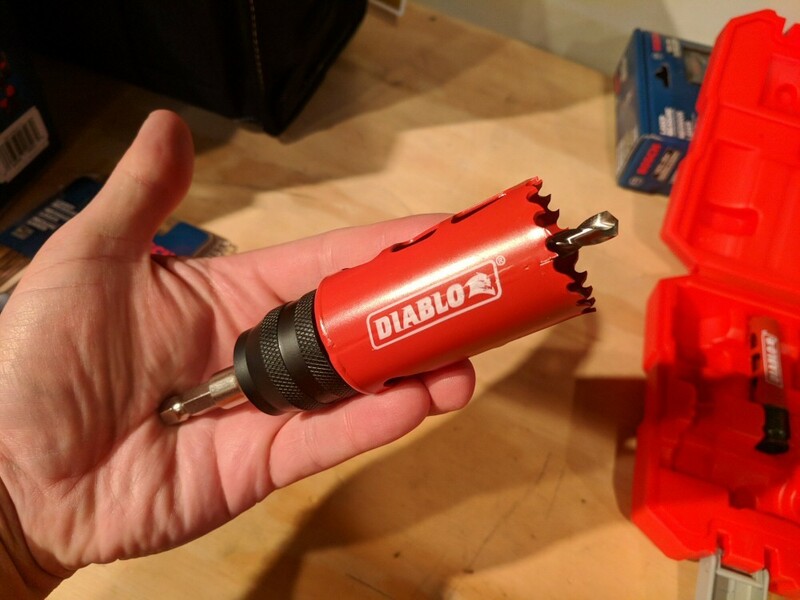 One of the best parts of the Diablo kit is the smart design that connects the mandrel to the pilot bit and the saws. Everything just snaps together with no additional screw-in adapters. The result is very fast changes between saws, or between a saw and a driver bit, depending on your application. 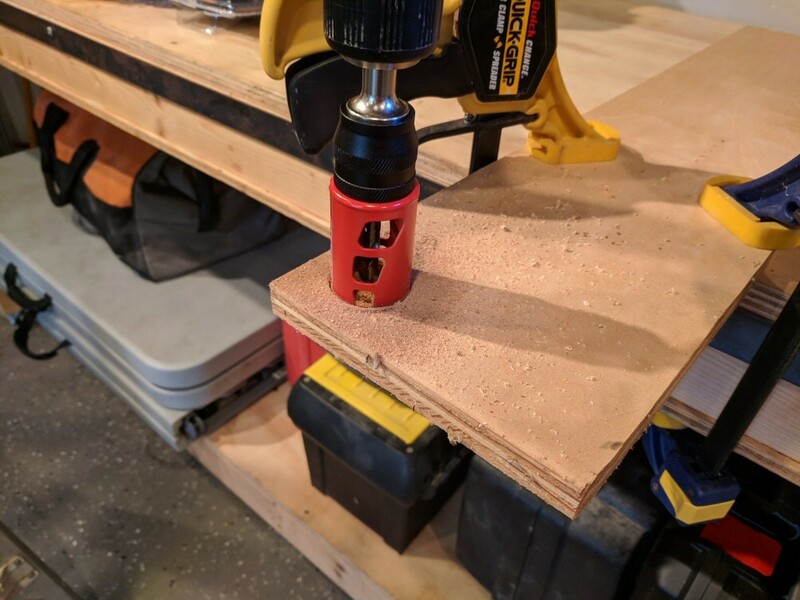 We were able to get testing in no time using our Ridgid drill/driver and testing through a scrap piece of 3/4″ plywood. Like all hole saws, these can produce tear-out on the bottom side of plywood and even dimensional lumber. You can avoid this by drilling until the pilot screw head reaches the other side but before the hole completes. 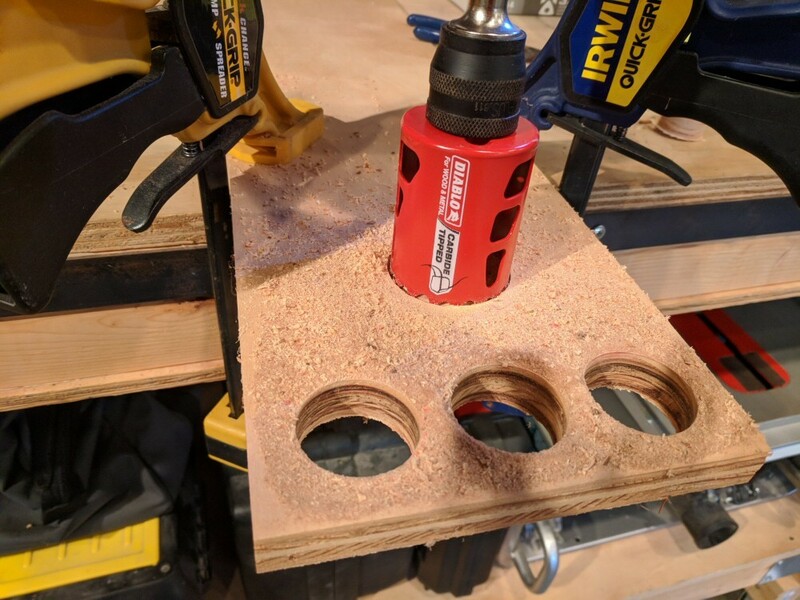 Simply flip the material and drill through the other side using the pilot hole as a guide. 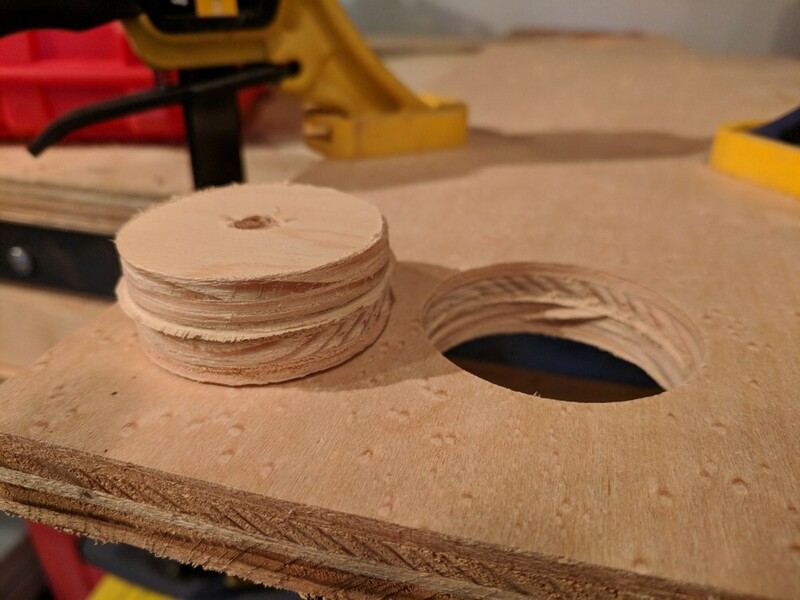 Typical one-sided drilling (below) – you can see the tear out on the plug draw out of this piece of plywood. Here’s a hole drilled using the “flip technique” described above to avoid tear-out. As you can see, the plug has a ridge around the center where the blades met. The inside of the hole can then be sanded for a perfectly smooth finish, if desired. Deeper Hole Cuts. Most hole saws have a 1-5/8″ cutting depth – just only enough to go through a piece of “2 by” dimensional lumber (i.e., 2×4, 2×6, etc.). Diablo’s saws are deeper allowing you to go through 2-3/8″ of material, equivalent to dimensional “2 by” lumber plus a 3/4″ sheet of plywood. 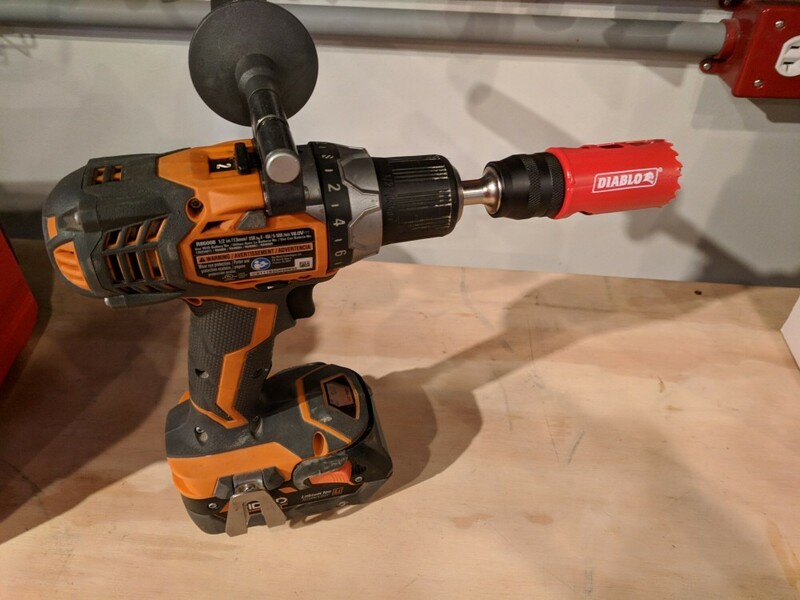 Quick Plug Ejection – Since the hole snap snaps into the mandrel, to remove plugs you simply pull the saw off the mandrel, removing the pilot bit, and making it very easy to eject the plug. 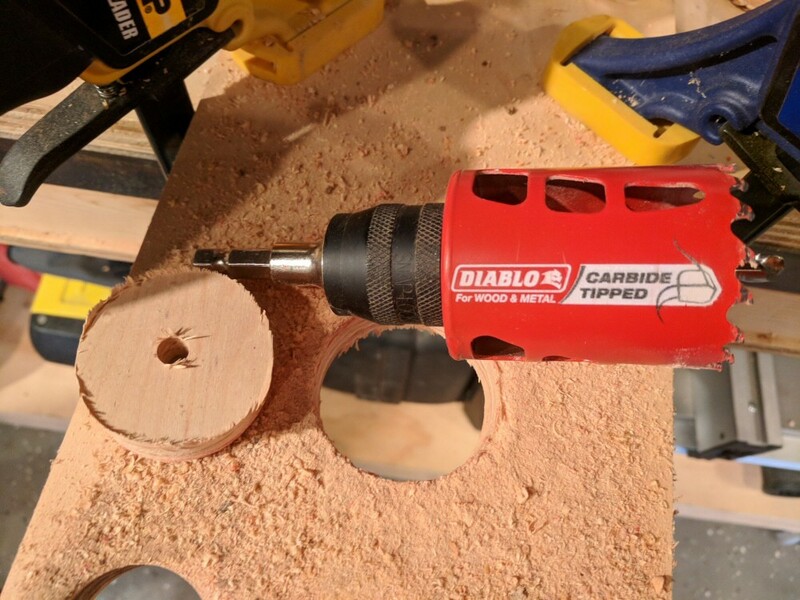 If you’ve ever struggled to get plugs out of a hole saw, you know how great this feature really is. Fast Saw Change – Because of the snap-on mandrel design, changing saws is extremely fast, which depending on your application could speed the job considerably. 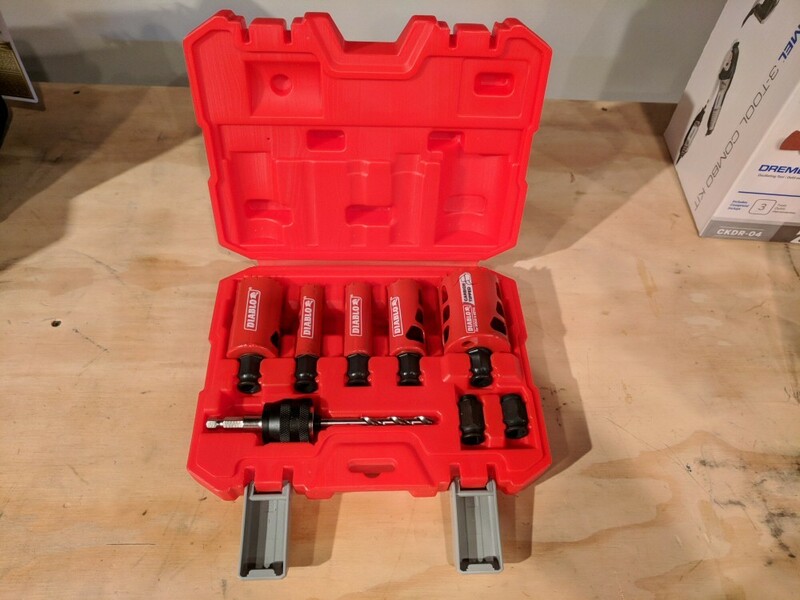 Diablo’s 9-Piece Hole Saw Kit is available at The Home Depot for $49.97, putting it in the sweet spot for holiday gift giving. If you or the special DIYer in your life don’t own a hole saw kit yet, this is a must buy for your future projects!